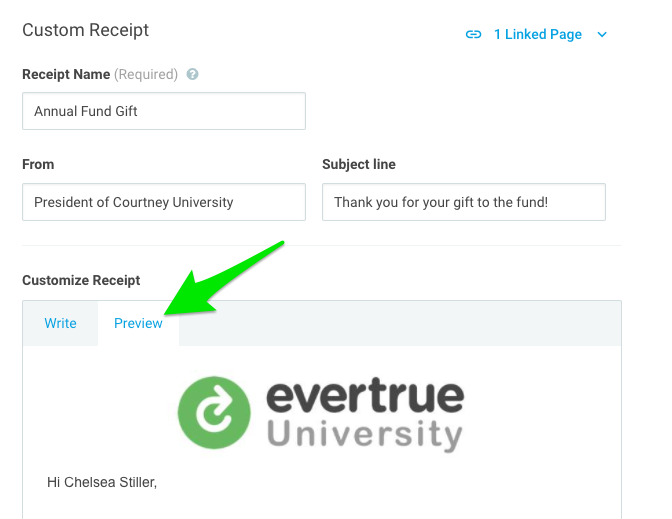 Customize your donor's gift receipts for any one of your EverTrue giving pages! Check out our video below to get started. To manage your receipts, head on over to our new Gift Receipts tab in the Giving Pages section of EverTrue. When writing your receipt, you can use different variables, hyperlink text, create headers, etc. Remember that EverTrue uses markdown syntax. This means, for example, that if you bold a word you'll see that word wrapped in double asterisks, e.g. **donation**. You can also use our default disclaimer or create a custom version, which is a great place to put tax information if needed. Preview the receipt right in EverTrue, but remember to SAVE first! Additionally, you can send a test email of the receipt to yourself to get a feel for the look and flow. Recurring gifts that were created when the page had no linked custom receipt will continue to receive Stripe receipts. Recurring gifts created when the page had a linked custom receipt will continue getting subsequent receipts from EverTrue, not Stripe. However, if the page no longer has a custom receipt linked, the donor will receive the default EverTrue receipt for the organization. All receipts will include a footer containing a customizable Disclaimer and the non-customizable enumerated gift details. The default account-level disclaimer can be set from Manage Account in the Giving Pages >> Action drop-down menu. Each receipt can use either the default disclaimer or a custom disclaimer. For pages using the EverTrue default receipt, the Charge Description field will be used as the disclaimer if no receipt disclaimer or default disclaimer is set. The disclaimer also supports markdown syntax. However, the disclaimer editor does not provide shortcut buttons for those options. Every receipt can display a header image. When adding a header image, you can upload a new asset or select one from your Asset Library. All current Live pages will continue to use Stripe's default receipt until each page's gift receipt is adjusted, if desired. You can choose to use the default EverTrue receipt if you do not wish to customize each receipt. Receipts that are currently linked to a giving page cannot be archived. To archive a linked receipt, click the "Linked Pages" dropdown in the top right of the receipt to unlink the associated pages, then proceed with archiving.